The park, campgrounds, trails and day use area are closed due to restoration efforts involving heavy machinery. Please do not enter the park. The park will reopen once work has been completed. Updates will be posted to this page when they are available. The park will reopen once the winds have subsided and appropriate assessments have been conducted to ensure it is safe to open to the public. Please check this page for updates. The campground and trails were heavily impacted by a major storm event, and clean up is underway. In the meantime, reservations cannot be accepted until further notice. A favourite destination on Vancouver Island is Little Qualicum Falls Provincial Park, which straddles the Little Qualicum River and incorporates the entire southern shore of Cameron Lake. Cameron Lake is an ideal spot for swimming and fishing, as well as sail boarding, due to a wind funnel created by the surrounding mountains. The Cameron Lake and Beaufort day-use areas are located 10 minutes west of the campground on Highway 4. 75 metres above the Middle Falls Bridge to the downstream park boundary below the Lower Falls Bridge is closed to swimming. Other areas in the park may be closed to swimming during high water periods. Check the park information shelters for swimming closure information. Those wanting to swim should visit the Cameron Lake day-use, located 10 minutes west on Hwy #14. Riverbanks can be very slippery. Stay away from cliff and riverbank edges. Sections of this river contain waterfalls, strong currents and other hazards. Boating is not recommended. Jumping from bridges or cliffs is prohibited. History: Established as a park in 1940 to protect the old growth Douglas-fir forest and the associated plant communities as well as the area around the river and the waterfalls. Ample opportunities for fresh water canoeing or kayaking exist on Cameron Lake, which can be accessed via the Cameron Lake day-use area and the Beaufort day-use area. Fishing opportunities are available in Cameron Lake. Cameron Lake is one of a few lakes in British Columbia known to have brown trout. Anyone fishing or angling in British Columbia must have an appropriate licence. There are 6 km of walking trails throughout the park. Trails leave from the campground and Little Qualicum Falls day-use area, meandering though old-growth and second-growth forest along the Little Qualicum River. For an easy walk, hikers can leave from the day-use area and follow a loop trail to view the lower and upper waterfalls. A lookout point is located along this trail, offering spectacular views of the river and upper falls. There are opportunities for fresh water scuba diving on Cameron Lake. 75 metres above the Middle Falls Bridge to the downstream park boundary below the Lower Falls Bridge is closed to swimming. Other areas in the park may be closed to swimming during high water periods. Check the park information shelters for swimming closure information. Those wanting to swim should visit the Cameron Lake day-use, located 10 minutes west on Hwy 4. There are opportunities for waterskiing on Cameron Lake. A wind funnel created by the surrounding mountains makes Cameron Lake a popular windsurfing destination. Cold water taps are located at the Little Qualicum Falls day-use area and the campground. Taps are shut off during the off-season. There is no drinking water provided at the Cameron Lake and Beaufort day-use areas. This park has three day-use/picnic areas all located within a few kilometres of each other. 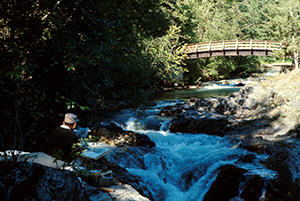 Little Qualicum Falls day-use area provides picnic tables, a picnic shelter, flush toilets and fresh water. Picnicking in the campground is not permitted. Pit toilets are located throughout the park at all day-use areas, locations along the trails and in the campground. Flush toilet buildings are located in the Little Qualicum Falls day-use area and in the upper campground. Pit toilets are located throughout the park at all day-use areas, locations along the trails and in the campground. Flush toilet buildings are located in the Little Qualicum Falls day-use area and in the upper campground. There is an adventure playground at this park, located adjacent to the upper campground. This park has vehicle accessible campsites in two separate campgrounds, the Upper campground and the Lower campground. Campsite reservations are accepted and first-come, first-served sites are also available.